Shalom wächst mit größtem Respekt vor Gott auf. 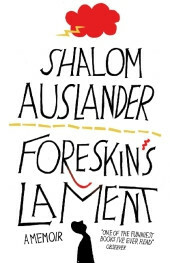 Foreskin's Lament erzählt von seinem Kampf mit Glaube, Familie und Gemeinde. 'America's hottest, funniest, most controversial young Jewish memoirist . . . blackly hilarious, groundbreaking' The TimesShalom Auslander was raised with a terrified respect for God. Even as he grew up, defying and eventually being cast out of his community, he could not find his way to a life in which he wasn't locked in a daily struggle with Him. Foreskin's Lament is a rich and fascinating portrait of a man grappling with his faith, his family and his community. 'Bracing and witty . . . Never, frankly, can there have been a more blasphemous book . . . Foreskin's Lament somehow expresses the ideas of Richard Dawkins in the tone of David Sedaris. You can read it for the humour, you can read it as reportage into a secretive and bizarre world, you can read it as a personal tale of triumph over adversity, or you can just read it for the misery. It doesn't really matter. But do read it' William Sutcliffe, Independent on Sunday 'One of the funniest books I've ever read, killingly so' Hilary Spurling, Observer'Exceptional . . . very, very funny' Time Out'Painfully poignant and hilariously noir' Jewish Chronicle'By turns hilarious and devastating . . . Few books are laugh-out-loud funny. This one is' Naomi Alderman, Sunday Times'America's hottest, funniest, most controversial young Jewish memoirist . . . blackly hilarious, groundbreaking' The TimesShalom Auslander wuchs in einer jüdisch-orthodoxen Familie in Monsey, New York, auf. Seine aufsehenerregende Sammlung von Short Storys, Vorsicht, bissiger Gott, erschien 2007 im Berliner Taschenbuch Verlag. Er schreibt regelmäßig Kolumnen und Kurzgeschichten für The New Yorker, Esquire und The New York Times Magazine. Shalom Auslander lebt in Brooklyn.